Some children may bite or hit. Their parents are generally just as horrified by it as you are. As they and your child’s daycare provider or preschool teacher are working on the problem, it may help to realize that for children under 3, it is a way to communicate their frustration or wanting a toy from another child. It may take a little while for the parent and daycare provider to work through the issue with the child. 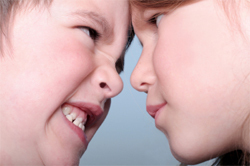 If the child seems overly aggressive you will need to make a decision for the welfare of your child. Whatever you decide, handling the situation with grace and compassion will go a long way in the eyes of the other child’s parents. Some situations require that parents of children in the same daycare discuss the issue. This may seem awkward, but if the provider can help both sets of parents, as well as the children involved, come to a solution, it may lead to a better environment for all. 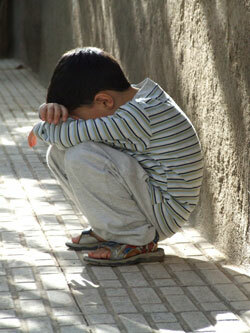 We know bullying occurs in school-age children, but it may also appear in daycare and preschools. It may not be constant, and it may not be to the degree that older children bully, but be sure to take your child seriously if he or she talks about experiencing this kind of behavior from another child. The first thing to do is listen and show love and support to your child. When you speak to your child, find out if there are certain times or circumstances during which the offending child begins bullying your child. Ask your child how he or she responds to the behavior. Perhaps you can offer some suggestions for your child to deal with the situation. It’s a good idea to talk to the provider about the situation. Perhaps he or she can offer some suggestions or let you know what the daycare is doing about the child if they already know about it. Keep in mind; bullying shouldn’t be trivialized as “kids being kids”. This type of situation can be very harmful to the victim. Also, a child who is emerging as a bully can perhaps be more easily set back on track than a child who has been displaying the behavior for years. Early intervention for all children involved may save a lot of heartache in the future and is very important for child development.